Dear Leader stepped all over his cheerleaders on state-run TV this morning. Apparently the Trump cheerleaders over on state-run TV didn't get the memo that Dear Leader was going to step all over their messaging this morning when they defended an interview that Trump gave to one of Rupert Murdoch's tabloid rags, The Sun, where he criticized British Prime Minister Theresa May over her "soft" Brexit plan. Fox's John Roberts actually played a portion of the audio recording of the interview, and said "the president might be wise to take a food taster with him" to his lunch with May after the critical interview he gave to The Sun. ROBERTS: Well that interview with The Sun newspaper blew up around the world into headlines that the White House didn't want to see going into this bilateral working visit that the president is making here to the U.K. prompting Sarah Sanders to issue a statement saying "The president likes and respects Prime Minister May very much. As he said in the interview with The Sun she is a very good person and he never said anything bad about her. He thought she was great on NATO today and really terrific person. 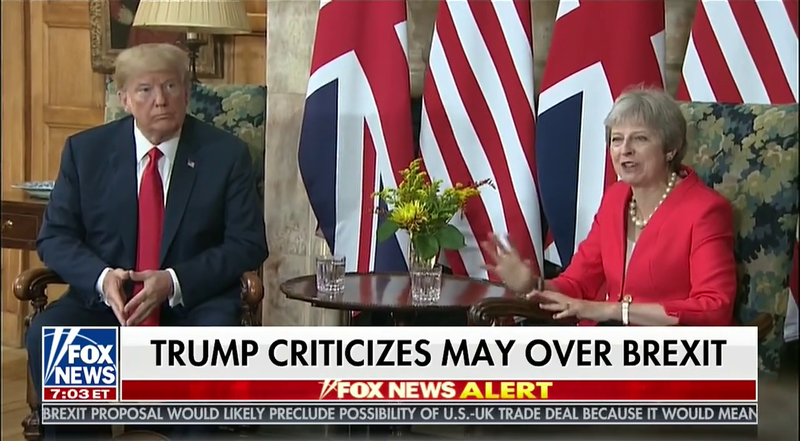 He is thankful for the wonderful welcome from the prime minister here in the U.K."
But in that same interview, the president also praised the recently departed foreign secretary here from the U.K. Boris Johnson who is a bit of a rival to Theresa May. The president saying that Boris Johnson would make a very good prime minister. We are told that in the press conference, which will be coming up in about an hour and 45 minutes that Theresa May will address this. So stay tunes for that live event. EARHARDT: Just because he doesn't agree with her politics doesn't mean he can't like her. as a person and deal with her and do business with her. They have different views on how they want to exit Brexit. She didn't want Brexit. DOOCY: But as John said today, maybe today the president needs a food tester, just in case. How long before they do a 180 and pretend they never said this?